Mary Hollinrake, born in 1912 in Todmorden, wrote her memoir covering the early years in her life, the first 20 or so years. Although Mary does not specify why she wrote “Lancashire Lass”, I believe it may have been to keep the memories of her childhood alive. Nan Hackett stated that “the working class autobiography was primarily “testimonial”; its purpose was to document a way of life” (209), which is very much the case for Mary. She goes into great detail on everyday aspects of her routine, such as writing around two pages on how her Grandmother washed, dried and ironed their clothes over a two day period. Despite not seeming significant to the reader, it may have been very important for Mary to include since it was something she saw happen every week during her childhood. 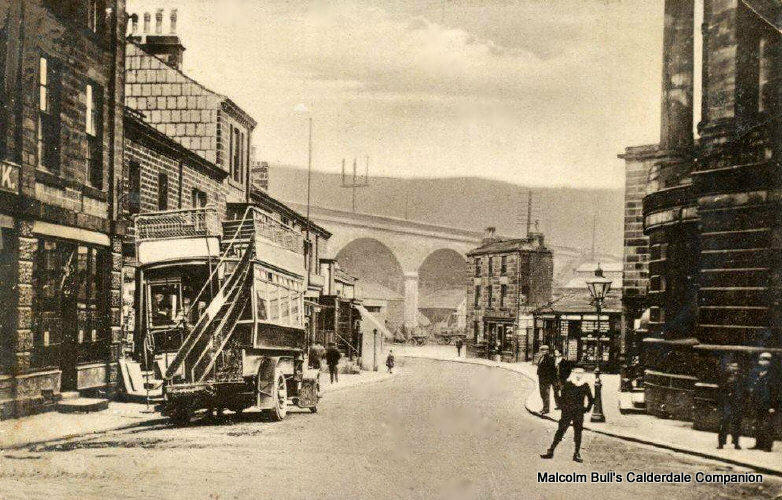 Burnley Road, Todmorden and the viaduct (taken after 1910). The first section of Mary’s memoir which is the first 31 out of the 73 pages could be defined as a detailed written family tree, going up to both her maternal and paternal grandparents. There was probably so much content since both her parents had many siblings, most of whom lived nearby so Mary saw them frequently. Regarding her family, topics range from describing appearances including hairstyles and fashion trends: “My aunts and mother were very fashion conscious as far as finances allowed” (9) to talking about her aunt Betsy who moved away from Lancashire and married a footballer. Recalling all these family members suggests that she may have wanted the younger generations of her family to learn about their ancestry, which is one of many reasons Regenia Gagnier states why the working-class write: “to record lost experiences for future generations” (342). While she does not suggest that there is anyone in particular that she is writing for, at one point she refers to her granddaughter (39), showing that there is someone it could be for but whether there are alternative reasons, I do not know. This also tells us that when writing her memoir, she may have been relatively old, although her age at the time is not specified. Throughout the memoir, there are numerous references to the present as she made many comparisons between her childhood to the present day. She stated that life then was “Certainly not the free and easy attitude today!” and when discussing her footballer uncle, she assumed “How surprised he would be at the adulation given and money paid nowadays” (15). By highlighting how times have changed, she is giving a first-hand experience of someone who has lived through that change, and therefore providing her very own account of history. Hackett, Nan. ‘A Different Form of “Self”: Narrative Style in British Nineteenth-Century Working-class Autobiography’. 12.3 (1989): 208-226. Image of Burnley Road, Todmorden after 1910.